Megazip Co., Ltd. is an authorized dealer of Suzuki Motor Corporation for outboard engines, accessories and genuine spare parts in the Kingdom of Thailand. We stock engines from 2.5 to 300 hp and offer a wide selection of parts and accessories for them. Our qualified staff is always ready to give their professional advise on the issues you are interested in and to help you to choose the right engine to meet your requirements. Everybody knows that efficient service of an engine saves both time and money and minimizes any possible problems in the future. All our engines are serviced by our professional technicians and provided a proper maintenance always in time. All kinds of electric and hardware marine equipment. Suzuki Marine outboards have proven its reliability and productivity throughout time. For more than 50 years history Suzuki outboard engines have won the highest awards for innovation and technology. Every year Suzuki Motor Corporation introduces advanced features and updated or even new models of engines. Visit our showroom if you want to be in touch with all cutting-age marine technologies. 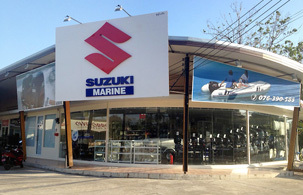 Here you can always find the wide range of Suzuki Marine outboard engines available to order in Thailand. Our clients are provided a fully qualified technical support: installation and removal of engines, overhaul and scheduled engine maintenance, computer diagnostics and troubleshooting. As a part of after-installation service customers can count on guidance by technicians during the first hours of break-in period. All boats are individually built, and it is always essential to use proper propeller pitch. Our engineers will help you to select the appropriate propeller for your boat so the engine could produce more power with less fuel consumption. One of the bonuses for our regular customers is an accumulating discount system: the more you buy the bigger discount you get. Boat dealers and manufacturers can also expect interesting and tempting offers.